Disney finally unveiled details about their Disney+ video streaming service today. According to the company, Disney+ will allow for offline downloads, be ad-free, plus allow members to create their own custom avatars from the company’s library, to go with customized settings and profiles. While the U.S. market will get Disney+ first, the company said “Over the next two years, #DisneyPlus will launch in each major region of the world!”. There was no specific mention of Canada, but you can bet it’ll launch here in some form. Disney+ is pegged to launch in this fall in North America, Western Europe and Asia-Pacific (through fall 2020), with Latin America set for a fall 2020 debut. Over the next two years, #DisneyPlus will launch in each major region of the world! ? Disney+ will have the company’s Signature Collection on launch day, while Marvel Studios’ Captain Marvel will also be available on day one, along with 18 Pixar films and theatrical shorts. Pixar will air its first original series on Disney+, ‘Forky Asks a Question’ along with ‘Lamp Life’ starring Bo Peep. Others Disney series expected are Noelle, Falcon & Winter Soldier, The Imagineering Story, Phones and Ferb and Clone Wars. There will be a documentary series titled, ‘Into the Unknown: Making Frozen 2’, taking audiences behind the company’s highly anticipated film. Another original will be ‘The World According to Jeff Goldblum’, says the company. Streaming Chief Kevin Mayer said, “We have the brands the matter most to consumers when it comes to great entertainment.” Mayer added Disney will likely bundle Disney+, Hulu and ESPN+. Also, Disney has over 1 billion ‘true’ fans, which helped the company take in $7 billion USD at the box office. Star Wars content will include movies, animated shows and new originals like The Mandalorian, the first ever live-action series from Jon Favreau. The first 30 seasons of The Simpsons will also be available at launch, thanks to Disney’s recent acquisition of 21st Century Fox. 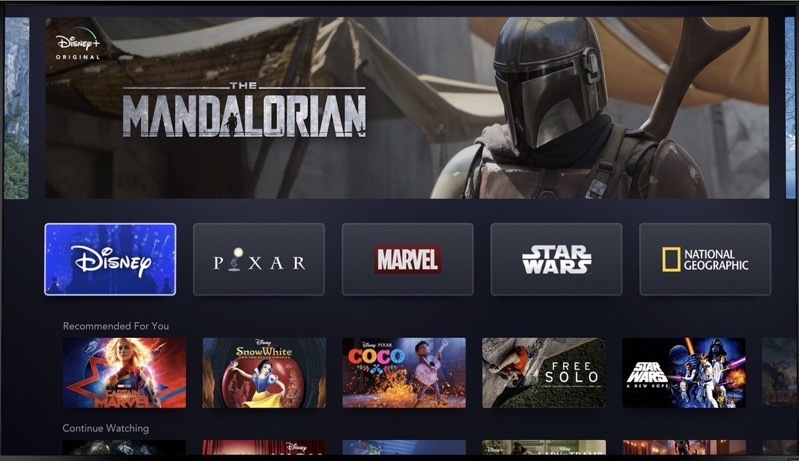 Below is your first look at Disney+, which has a featured carousel, followed by titles you can select based on categories, such as Disney, Pixar, Marvel, Star Wars and National Geographic, for example. There will be sections with recommended titles and also below a ‘Continue Watching’ section to let you resume your previously viewed titles. Disney+ will be available on smart televisions, game consoles, Apple TV, connected players, plus Roku TV and PS4 at launch. 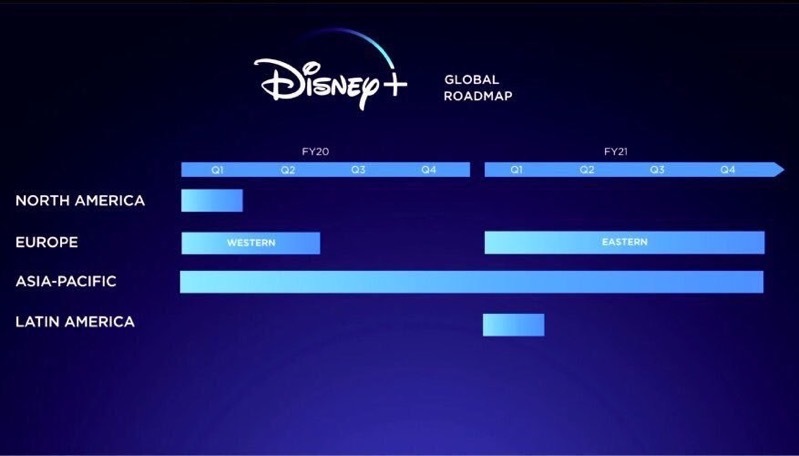 No word on what the cost will be for Disney+, but guesses would include a price in the $10-$20 per month range? With so many streaming services available now, how can one possibly watch everything from all of these companies? Are you excited for Disney+ if and when it debuts in Canada? Update: Disney+ will launch on November 12, 2019, in North America. Pricing will be $6.99 USD per month or $69.99 USD per year. The slow worldwide rollout is due to Disney waiting for existing rights agreements to expire. No word on Canadian pricing yet, but we’ve reached out to Disney and will update this post accordingly. Also, Disney confirms the service will be available in 4K HDR. Update April 12, 2019: Disney has confirmed the service is coming to Canada.